Princeton's student housing organization sent out a survey posing this question. I answered in the typical fashion: activities, my co-op, my classes, the friends in my major, etc. Oh, and the bathroom. For the first two years at Princeton, I enjoyed a private bathroom with my roommate. We reveled in our privacy and often boasted about our private bathroom status. We didn’t want to even think about fighting over showers or wearing shower sandals. 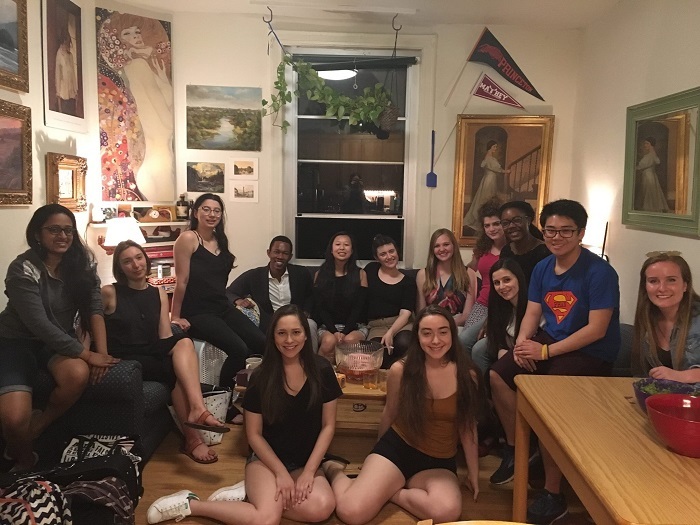 At the end of sophomore year, I was accepted into the Edwards Collective, a residential community on campus for those interested in the arts and humanities. I was ecstatic and was only concerned about one thing: a public bathroom. To my surprise, shower sandals aren’t so bad. And I only rarely had to wait to hop in the shower. The horror stories my other friends told didn’t match my experience at all. In fact, some of the best parts of my day were spent there. The secret? My hallmates were chatty in the bathroom. As we brushed our teeth or washed our faces, we’d swap stories about our days. I looked forward to hearing more about the progression of someone’s senior thesis or seeing new videos of a dance routine. With a few of my hallmates, it was a time to practice my German and discuss deep ecology. With everyone, it was a time of encouragement and sympathy. During finals, every exchange ended with wishes of good luck and gentle admonishments to get some more sleep and to take care of oneself. The Edwards Collective, my residential community. Photo by Maggie Kurkoski. Many first-year students want singles and private bathrooms. In my opinion, this mentality reflects how some students first think about success. Upon arrival, you may want to isolate yourself and only focus on your studies. Over time, you start to realize that your success isn’t dependent on others’ failures. In fact, connecting with other people and hearing about their passions is a great way to deepen your education. So, even those late night talks in robes and sweatpants have value. They’re an integral part of the Princeton experience, and a pleasant reminder that you belong.